The Bitcoin platform Coinbase is reportedly tracking what their customers are buying with Bitcoin, as well as closing any accounts involved in transactions that break the company’s rules. “In the last day we have had players who found their Coinbase account closed because they withdrew coins from SatoshiBet.com to their Coinbase account. We heard similar stories from other gambling sites (Seals with Clubs, Betcoin, …). Switch to Blockchain.info, folks”, the company wrote on Reddit using the user account ‘satoshibet_com’. It appears that, even thought online gambling is not illegal, Coinbase is shutting down accounts that are connected to Bitcoin-friendly gambling websites. Also, another Redditor – this one known as ‘white1ice’ – claims that Coinbase banned his account for allegedly purchasing cannabis products with cryptocurrency purchased via the company, CoinTelegraph reports. 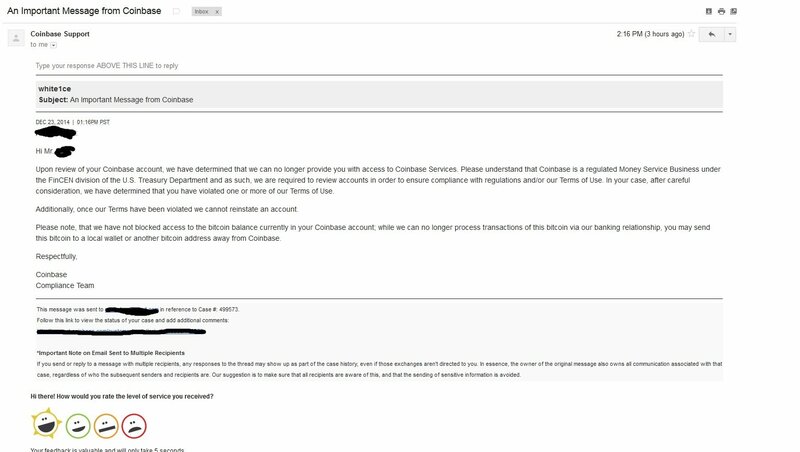 “I have been a long time coinbase customer, buying 1-3 times per month, I got an email today saying they are banning me from using their services because of a ToS violation. I emailed them back to ask what the violations [were]and they told me that they have evidence that I used some of the BTC I bought for cannabis/cannabis seeds. They gave me a specific BTC transaction and said it was for drugs and wouldn’t listen to anything I had to say”, the Bitcoiner said. The Redditor added that “this should be rather alarming, first of all, they are monitoring how you use and spend BTC which kind of defeats the entire purpose of BTC. Secondly, I never ever once even thought about buying drugs, let alone online, so that’s pretty messed up”. There is also the case of a Coinbase user that lost his account after being accused of selling BTC on LocalBitcoins after buying the cryptocurrency through the company. In the meantime, the United States-based platform issued a comment regarding the matter. According to Coinbase, the company is merely trying to comply with federal anti-money laundering regulations and anti-drug laws. However, the fact that the business is tracking its clients’ purchases is creating a huge controversy around privacy and consuer rights. We loved cryptocurrency for it’s decentralize featured so monitoring user financial activities is not ideal. Though Coinbase cryptocurrency exchange is still one of the top crypto exchange platform all around the world.